"I was strapped to a rocket and shot out of a cannon," said Benson, the company's CIO. "My job was to figure out what tools were needed." Originally founded in 1983 under the name Old Country Buffet, Ovation had grown considerably over the years to comprise more than 300 restaurants in 35 states, operating under brands including Tahoe Joe's Famous Steakhouse and Ryan's. "We were conducting business in a much different way that was better and faster than our systems could keep up with," Benson explained. Roughly 18 months later, Benson and his team are about a month into a brand-new Oracle Cloud implementation that's at least as notable for its consumer-style interface as for its ability to support the way the company's employees work today. Ovation data collected by Oracle's Micros Simphony point-of-sale systems is uploaded throughout the day to the Oracle Cloud. Managers can use the company's MyMicros BI and Micros InMotion mobile tools to view it in visual fashion across myriad desktop and mobile devices. Key dimensions are frequently represented as concentric circles, with the ability to color-code for visual cues. Users can sort, filter and analyze the data across multiple regions, down to the specific line items of individual guest checks, all in near real time. 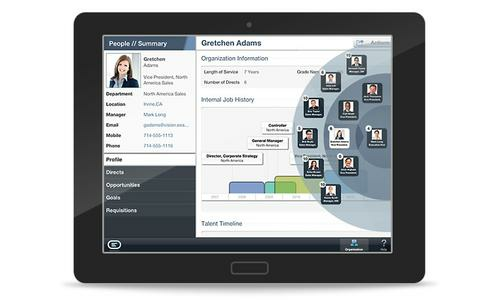 The result is that Ovation's business users can more easily identify what's important. "We run self-service restaurants," Benson said. "We don't need our store managers wading through pages of data, and we don't need or want an enormous support staff trying to generate reports that are stale as soon as they come out. We needed self-service tools to put in front of users." It's a trend that has become more evident with just about every new enterprise application to debut recently: the traditional, text-driven and often unintuitive interface once common in enterprise software is increasingly a thing of the past. Taking its place is a more visual, intuitive, cross-platform and mobile-inspired experience that can better satisfy what today's users expect. "Traditionally, IT has done a great job of building and deploying highly functional systems for our users, but not so great a job at making those systems user-friendly, intuitive or easy to use," said Sheldon Smith, director of technology innovation for SaskPower, a Saskatchewan-based electric utility. Until fairly recently, that wasn't too much of a problem at SaskPower, as employees who used the company's legacy tools regularly eventually got used to them. "We have a lot of systems that were built many years ago for basic tasks such as approving work orders, notifications and time sheets," Smith said. Functionally and technically those tools worked just fine; besides, few employees had experienced anything in their personal lives to compare them with in terms of usability. It's a different story today. Not only are consumers of all ages and levels of professional experience embracing mobile technologies outside of work, thereby escalating their personal ease-of-use expectations, but an older generation of senior professionals is gradually retiring. Coming up in its place is a new generation unwilling to settle for anything less user-friendly than what they've grown up with. "These employees have the latest, greatest technology at home, and they expect to have as good or better technology at work," said Smith, whose department focuses explicitly on end-user enablement. "When they get a personal smartphone, they open the box and typically it contains a device, a charger and a set of earbuds, and they are up and running in minutes -- no learning, no manual, no training course. Our employees have the same expectations of our internal systems." Today, SaskPower is focusing on extracting some of the more complex functionality from its existing enterprise systems such as SAP ERP technology and building it instead into mobile apps or other simple, narrowly focused tools. "Our target audience is the casual user -- the person who may not use the complex system every day, and therefore is not a power user," Smith said. Among the results are apps for workflow and time-sheet approvals, for example, designed specifically to be intuitive for non-expert internal users. SaskPower supports only iOS for its mobile users, and it has embraced SAP Mobile Platform for custom development. Last year, it built 29 custom apps -- many of them based on SAP, but some working from Lotus Notes functionality instead. It has also implemented three apps so far featuring SAP's recently launched Fiori interface. Indeed, it's clear that the larger software companies building the current generation of enterprise applications are well aware of this evolution in user preferences. "The topic of user experience is something we've been working on a lot," said Simo Said, vice president of product marketing for enterprise applications and user experience at SAP. "We have clearly seen a shift in demand from business users." In developing the Fiori interface featured also in its newly launched S4/Hana enterprise suite, for example, SAP aimed to ensure that users would have to take a maximum of three steps within the system to arrive at the insight they're after. "Personalization is even more important here than in the consumer world," Said explained. "Facebook fits everyone, but for us, the same user experience needs to be tailored for each role within the organization." Responsiveness was the third pillar that drove SAP's creation of Fiori, he added, with heavy reliance on the real-time capabilities of the company's Hana in-memory database. Oracle is another company that has focused on providing a modern interface, and part of that has been ensuring that the experience for users is consistent across devices, said Rajan Krishnan, the company's vice president for applications development and product management in the Americas and EMEA. Also at the forefront of Oracle's efforts has been making analytics an integral capability. "It used to be that you'd go into a transaction processing application, move out the data you wanted and then get the reports you needed," Krishnan explained. "Now you don't have to leave a process hanging and go elsewhere to finish it -- you can take action right there." Social capabilities, meanwhile -- often with interfaces emulating the style of Facebook or Twitter -- help to facilitate collaboration, thus closing the gap between insight and action, he added. With easier-to-use applications, business users can more often serve themselves without needing to rely on IT for reports or other basic functionality. That lightens IT's load, and it also makes those users more likely to make data-driven decisions, noted Rick Schultz, senior vice president of marketing for analytics-platform provider Alteryx. Other benefits include faster deployments and less time spent on training, SaskPower's Smith said. Change management also becomes easier. "Everybody shops on Amazon -- everybody's used to this kind of stuff," Ovation's Benson said. If there are any downsides to the consumerization of enterprise software, one might be that there's less room for the elaborate customization that was once common in enterprise applications, he noted. Ovation, however, has made a deliberate decision to embrace the best practices typically at the heart of today's ready-made packages -- "we're often far better off," Benson said. Overall, there's little doubt that by making users happier with their work tools -- and being able to deliver them faster than ever before -- IT stands to gain at the very least in terms of customer satisfaction. That, in turn, can elevate the IT department's focus. "As opposed to having an IT group who are coders, developers and tinkerers, we've been able to change the perspective and discipline to focus on business partnership," Ovation's Benson said. "We've become business professionals who understand and have tools to quickly develop business solutions."